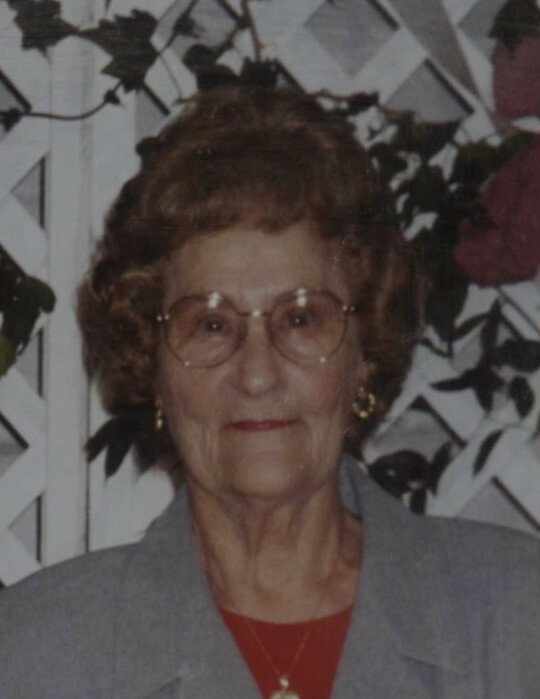 Funeral services for Ellavee Mary Patterson Hunt, 96, of Williston, SC, will be held at three o’clock p.m., Sunday, February 3, 2019 at Mt. Beulah Baptist Church, Windsor, SC with the Reverend David Richardson and Steven Proctor officiating; burial will be in the church cemetery. The family will receive friends one hour prior to the service at the church on Sunday. Memorial contributions may be sent to Mt. Beulah Baptist Church, 857 Mt. Beulah Rd., Windsor, SC 29856. Mrs. Hunt passed away on Friday, February 1, 2019. Born in Unaka, Cherokee County, NC, she was a daughter of the late George Thomas Patterson and Eustice Josephine Murphy Patterson. She was a member of Mt. Beulah Baptist Church, formerly worked at Bud Burma and retired from Williston Manufacturing. She loved gardening, sewing and crocheting. Survivors include her loving husband of 78 years, Theodore Franklin Hunt; daughters, Jewell Keenan, Barbara (Dairl) Snider of Windsor, Betty Proctor, Linda (Casey) Proctor of Williston, Wilma (Steven) Berry of Lexington, Donna Lott of Williston; grandchildren, Randy Keenan, Del Keenan, Kenneth (Pamela) Keenan, Gary (Donna) Snider, Tracy Snider, Deanna Proctor, Kim Randall, Wanda (Steven) Jeffcoat, Doyle (Cassie) Proctor, Robert (Missy) Proctor, Steven (Tracey) Proctor, Ryan (Kayla) Proctor, Robin Hanna, Kevin Hanna, James (Sara) Hutchinson, III, Tonia (Doug) Platt, Adam (Paige) Robinson. 31 great grandchildren and one great, great grandson. She was preceded in death by a granddaughter, Gail Proctor; sons-in-law, Wallis Keenan, James Hutchinson, Jr.; a grandson-in-law, Joe Randall; 3 sisters, 4 brothers.